Comes standard with 6 antique brass Teardrop Pulls. 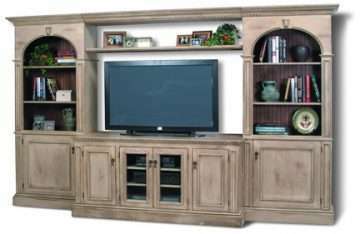 Center unit features 2 seedy glass doors with 2 adjustable shelves, 2 hidden storage units with 4 adjustable shelves, and a large TV area with 1 adjustable shelf. Center unit is drilled for wires behind all doors. Side units feature open display with beadboard interior back and 4 adjustable shelves, and 2 hidden storage units with 2 adjustable shelves. Ships in 6 corrugated cartons: Cabinet left (83 lbs), cabinet right (83 lbs) cabinet center (118 lbs), top cornice & center shelf (31 lbs), side adjustable shelves (31 lbs), and center adjustable shelves (41 lbs) on 2 wooden pallets (100 lbs).